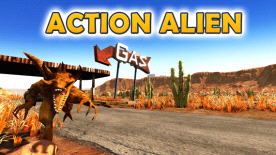 Jump into the action and battle your way through hordes of aliens from canyon deserts to tropical islands! Complete the story-driven levels by collecting gas cans and defeating boss aliens to unlock upgraded weapons and perks to achieve the maximum fire-power, or play the survival game mode and try to hold on for as long as possible! There are many different kinds of aliens to fight in various environments, as much as weapons and items to find! 3 large open world maps set in different places and guided by story lines. 2 survival maps with the goal of resisting against aliens for as long as possible. 8 weapons ranging from the revolver, the tommy gun to the grenade launcher with each one having 2 levels of upgrade increasing their efficiency. 3 species of aliens requiring different tactics and weapons to defeat them. Fully destructible environments as much by the player as by the aliens. Support of Steam trading cards. Support of Steam cloud to keep all progress available on any computer. Many customisable settings and tweaks. The game is developed by one indie developer and is being continuously updated, so more content may come in the future!